CALGARY — Financial analysts grilled Kinder Morgan Inc. executives on how the company would use the proceeds from its $4.5-billion sale of the Trans Mountain pipeline and expansion project to the federal government. The windfall comes after an intense two-month negotiation between the Houston-based pipeline giant and Finance Minister Bill Morneau, which culminated in Ottawa buying the Trans Mountain pipeline and troubled $7.4-billion expansion project between Alberta and B.C. on May 29. The deal is expected to close in the late summer or early fall, and the company has begun deliberating how it will use the cash. Kean, CEO of both Kinder Morgan Inc. and its Calgary-based subsidiary Kinder Morgan Canada Ltd., explained that the parent company intended to use its share of the deal to pay down debt but hasn’t settled on what to do with the subsidiary’s portion. “While all options are on the table, we generally don’t think it’s attractive to shareholders for us to sit on a pile of cash while management looks for a transaction to use it on,” he said, shooting down questions from analysts about whether Kinder Morgan Canada could acquire other assets. The picture is much clearer for the Houston-based parent, which has been taking steps to reduce debt. The sale of Trans Mountain is expected to reduce indebtedness by another US$2 billion. “We intend to use KMI’s share of the proceeds generated from the sale of the Trans Mountain pipeline for $4.5 billion Canadian to pay down debt,” Kinder Morgan founder and executive chairman Rich Kinder said, referring to the parent by its stock ticker, KMI. Both Kinder and Keane said they were pleased with the deal and outlined various growth projects the company planned to undertake in Texas. In the months leading up to the deal, Kean had repeatedly said Kinder Morgan needed assistance from the federal government for the expansion, given opposition from the NDP government in B.C., which had implemented additional regulations aimed at halting the expansion. Since Ottawa purchased the project, lawyers for Trans Mountain have requested a larger injunction zone around its worksites and the company has announced construction would begin in Alberta in August and in B.C. in September. 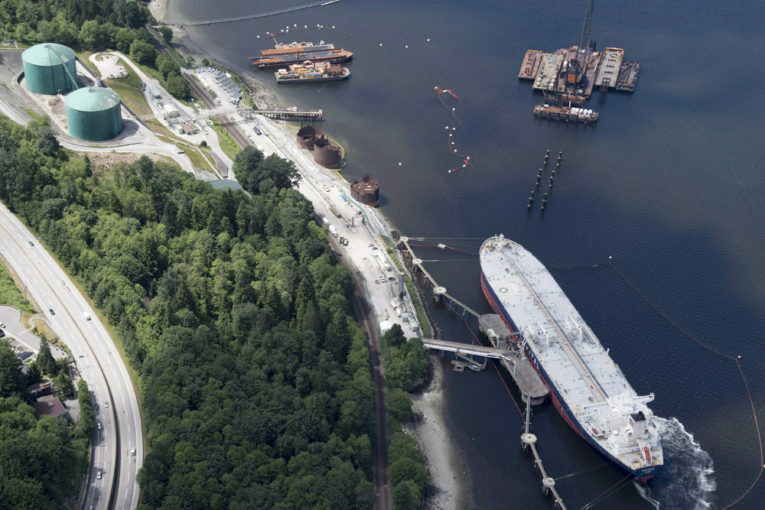 In a regulatory filing last month, Kinder Morgan said it had been concerned that Burnaby was not ensuring the work sites were safe, as protesters frequently breached the injunctions to disrupt activity. In financial disclosures Wednesday, the company announced it had now spent $1.3 billion on the expansion project. The company also cancelled the credit facilities it planned to tap to finance the remainder of the project. The company also announced the Trans Mountain pipeline system had been over-subscribed each month in the second quarter of the year as Canadian oil production currently outstrips available pipeline capacity. Kinder Morgan Canada reported net earnings of $13.7 million for the second quarter, a decline of 45 per cent from the $25.1 million in the same quarter a year earlier.